The US sanctions against Venezuela, signed into law by President Barack Obama on December 18, 2014, resulted from charges of protestors’ rights being violated by the socialist government of President Nicolás Maduro. The sanctions allow the Obama administration to deny visas and freeze the assets of Venezuelan officials accused of violating the rights of anti-government groups. These groups, comprised mainly of the right-wing opposition, have been leading violent protests in Caracas since last February. US leaders blame the Venezuelan leadership, headed by the United Socialist Party of Venezuela, for the deaths of 43 people during such demonstrations, which included both government supporters and opponents. The US has been heavily invested in Venezuela for many years, financially and politically. By 1928, Venezuela became one of the world’s leading oil exporters. Today, it is a member of Organization of the Petroleum Exporting Countries (OPEC) and is third largest oil supplier for the US. For several decades, the nation’s corrupt leadership plunged the majority of the population into poverty. By 1998, that all would change with the election of Bolivarian presidential candidate of Hugo Chávez. As president, he implemented massive reforms to benefit the previously-exploited people of Venezuela. 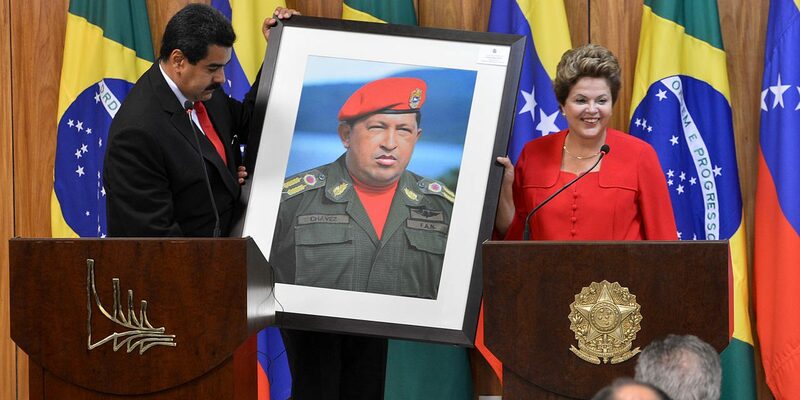 Chávez promoted united Latin American petroleum operations as well as a regional free-trade bloc, which enraged the imperialists in D.C.
“The State Department had always expressed its preoccupation with Chávez,” according to former Venezuelan military officer Fernando Orchoa. Given Chávez’s refusal to act as a lapdog for the World Bank and the International Monetary Fund, the administration of George W. Bush supported a coup against the Venezuelan government on April 11, 2002. Chávez was forced out of office until a counter-coup led by his supporters restored him to power three days later. The White House, while denying its involvement in the coup, referred the events of April 11 as a “change of government,” a misleading euphemism with Orwellian undertones. The concerns shared by Maduro and his supporters that the US is endorsing right-wing elements in the country to provoke the overthrow of the government are vindicated by decades of similar precedents. The last century shows a lengthy history where the US toppled democratically-elected governments in order to establish corrupt regimes that would serve corporate interests. In some cases it actively suppressed genuine populist uprisings that would have served the best interests of the people living in those countries. In the 20th Century, these actions were done in the name of “Anti-Communism.” The main architecture of this foreign policy, as well as the execution of it, has been the handiwork of the Central Intelligence Agency (CIA). It would seem as if the CIA adopted the ideological attitudes of the Third Reich, such as the notion that an attack from the Soviet Union (often labelled “the Evil Empire”) was imminent against the West. This outlandish theory was suggested by Richard Gehlen, a Nazi General and intelligence chief for Adolph Hitler. Gehlen was one of the many of his ilk spared by the agency after the war when others were tried at Nuremberg. His “warning” later was echoed by President Harry Truman, who signed the National Security Act in 1947 that gave birth to the CIA. Latin America became a hotbed for runaway Nazis and fascist sympathizers after Germany surrendered to Allied Forces in the spring of 1945. Several notable war criminals managed to escape through Italy in what were called “ratlines” and fled south of the equator. For years they resided in Argentina, Brazil, Paraguay and other nations that would accept them. This loosely-connected network would become useful to the US government in building groundwork for the financial elements it serves. As with the experiments of the Nazi scientists under their protection, the agency formulated plans for turning Latin America into a kind of geopolitical laboratory with millions of human guinea pigs for them to study and dispose of as seen fit. America’s involvement started when Árbenz expropriated 160,000 acres of unused land belonging to the United Fruit Company (UF), owned by the Rockefeller dynasty. Árbenz offered UF financial compensation amounting to $604,572 instead of the $16 million the company was seeking. UF responded by waging PR campaign to smear the Guatemalan president and his government as “red” and “communistic.” This was done with the help from President Dwight Eisenhower and CIA heads (and former Wall Street lawyers) Allan Dulles and John Foster Dulles. The agency would replace Árbenz with Guatemalan Colonel Castillo Armas. Armas received military training at the US Army installation in Fort Leavenworth, Kansas from October 1945 until April 1946. During this time, he came in contact with American intelligence officers. He later formed the “National Committee of Defense Against Communism,” acknowledged by many historians as the first modern death squad in Latin America. Strangely enough, he even had a moustache that resembled the one worn by Adolf Hitler. He was assassinated in 1957. Historian Nick Cullather, author of Secret History: The CIA’s Classified Account of Its Operations in Guatemala, 1952-1954, makes the case that the Guatemalan experiment would provide the future model of such operations, including the failed Bay of Pigs invasion in Cuba (1961) which attempted to remove Fidel Castro and his fellow Communists from power, resulting in the deaths or injuries of hundreds of Cubans. For the next forty years, various regime changes would lead to the deaths of over 100,000 Guatemalans. The CIA sponsored the coup that would end the oldest functioning democracy in South America with their actions in Chile. In 1970, physician and socialist Salvador Allende was elected president by a substantial majority. The Richard Nixon administration was worried that Chile would be another Latin American country to go leftward in its internal affairs. Secretary of State Henry Kissinger, a war criminal who has still not been brought to justice for assorted crimes spanning over four decades, worked with eager henchmen in the agency to dismantle the Allende government by any means necessary. The US provided funding to the fascist group Patria y Libertad, which means “Fatherland and Liberty.” They also trained counterrevolutionaries in the art of guerilla warfare and bomb-making. The September 11, 1973 coup was a success, and Allende and several of his ministers were killed. Opposition leader General Augusto Pinochet would seize the helm of power over the destabilized nation. El Salvador, a nation ruled by an oligarchy comprised of its 14 wealthiest families, started experiencing dissent from exploited workers and peasants. What started off as a civil war mutated into one of the deadliest decades of fascist oppression and US-sanctioned human rights violations since World War Two. From 1980-1985, the US government provided upwards of $2 billion in aid to the rightwing junta and its death squads (paramilitary units specializing in assassination and coercion). They also provided air-cover and weapons to be used against leftist revolutionaries. Such death squads were led by the likes of René Chacon and José Medrano, who were trained at the International Police Academy in Washington D.C. and the Jungle School in Panama. In the course of eradicating “Godless Communism” from El Salvador, these death squads murdered an Archbishop, four nuns and 18 priests. Such news received little attention from the American press, because it would tarnish the image of those who are trying to “build democracy” in the country. Pleas for the US to stop aiding the junta were ignored during the administrations of James Carter, Reagan and others after them. The UN Truth Commission, in 1993, concluded that over 63,000 Salvadorans were murdered from 1979-1992. The United States will try to provoke anti-government sentiment and encourage the leaders of the right-wing opposition to lead a coup in Caracas. If possible, such an uprising will be manipulated to look like an organic populist revolt without any bloody fingerprints left behind by the US. But as history shows, the US always seems to leave behind evidence at the crime scene, including witnesses. Mike Kuhlenbeck is a journalist and researcher whose work has appeared in The Humanist, Z Magazine and The Des Moines Register. He is a member of the National Writers Union and Investigative Reporters and Editors.